Perhaps the only items we birders love as much as our binoculars are bird books. Happily, there is no shortage of titles. 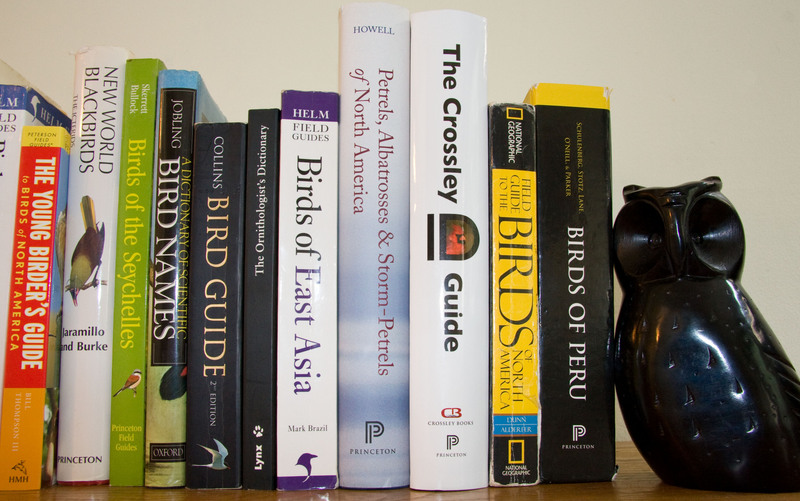 What follows is a suggested list of books that any birder would benefit from owning. Some titles and authors will be familiar, but others may have flown beneath the radar. Some are easy reading, while others require a reader’s actively applied attention. Each has its place. In composing this list I’ve pretty much neglected the ever-popular question, ”If you had to choose one North American field guide, what would it be?” I’ve thought a lot about the question, yet still have trouble answering it. Each guide has its strengths. I own all of them, using each for different purposes. So, putting aside the field guide question for the time being, the question this list seeks to answer is: “If you were starting a new birding library, which titles would you begin with?” Here are some good choices for ABA Area birders, in no particular order. Superbly written and edited, this book makes a lot of complex concepts about birds accessible to the layperson. A fun, informative and easy read. For us, this is our “On the Road”. This is our “Dazed and Confused”. Kingbird Highway was “the big year” before there ever was The Big Year. The latter being indeed a fine piece of writing by a fantastic author, but it’s hard to imagine that story ever existing without Kaufman’s vintage coming-of-age journey paving its way. When Kaufman hit the road at age 16, hitchhiking around the country over the 12 months of 1973, there was no Internet, no GPS, no text alerts, and certainly no smart phones. This was in many ways the golden age of birding. The ABA was just blossoming, Peterson’s guide was the only one really available, and people birded using the Jim Lane bird-finding guides, and also word-of-mouth. Kingbird Highway shall remain forever a classic. A review in The Smithsonian (Jan. 1998) by Richard Wolkomir states that, ”This book is only tangentially about birds”, and it’s true, but it is very much about birders and birding, and because of that it’s a book many non-birders enjoy. 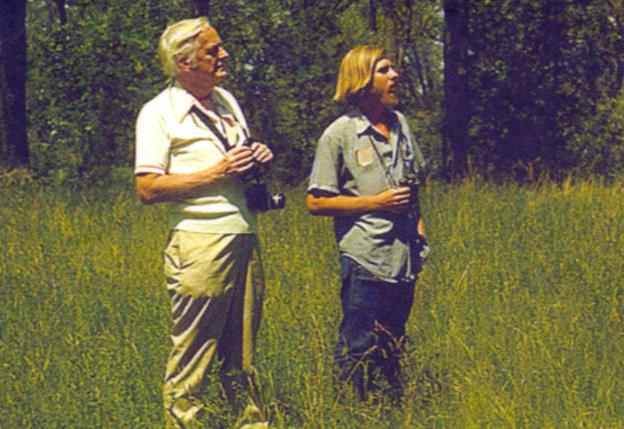 Roger Tory Peterson & ABA board member Kenn Kaufman (right) birding together. There is an old Chinese proverb that goes something like this: “knowledge begins with putting a name to something”. That was what Peterson’s field guide in 1934 allowed people to do, for the first time really. Accomplished Stanford biologist Paul Ehrlich wrote of Peterson in his Birder’s Handbook (1988) that, ”In this century, no one has done more to promote an interest in living creatures than Roger Tory Peterson, the inventor of the modern field guide.” If Peterson’s field guide allowed people to finally put names to feathered things, then Birds Over America was the book that really conveyed his love of birds, and the thrills he experienced while birding. In the same vein as the two previous entries, and this book too is a masterfully written chronicle about a year’s worth of birding. The reader is treated to chapters on Roger Tory Peterson’s take on the future of our most cherished past-time, a recounting of the tale of the “Bird of the Century” (the famous Newburyport Ross’s Gull), and profiles of unforgettable characters, such as Louis Banker. Like Kingbird Highway, and the Peterson entry above, this book is itself a piece of North American birding’s history. 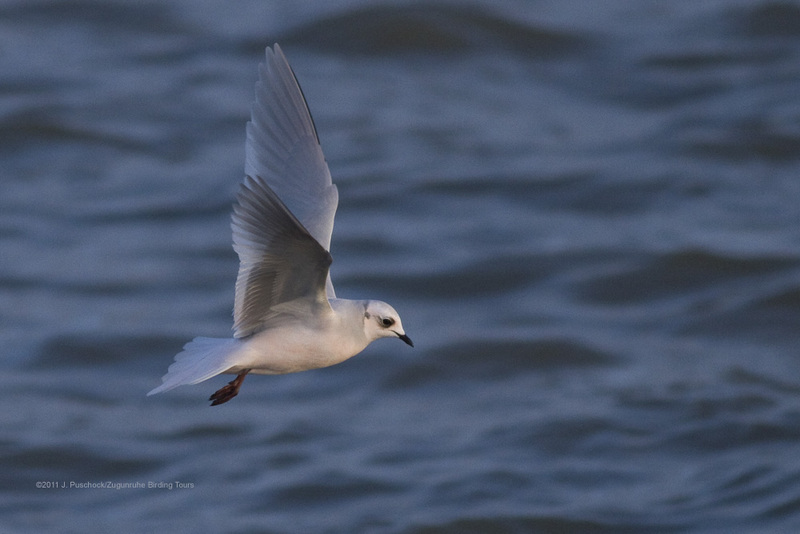 A basic-plumage adult Ross's Gull at Barrow Alaska (photo by John Puschock), referred to in The Feather Quest as the "pink pukka of the north". This individual isn't especially pink, but still shows the elegant features associated with this ghost of the arctic. Howell’s Molt book is a masterpiece. As arguably the most prolific bird book writer today, Howell dives headlong into a subject seldom tread upon, yet instrumental in birdlife. Molt is a subject that makes many birder’s eyes glaze over, and this book is not always easy reading, but it richly rewards the efforts by the reader to disentangle this interesting subject. Consider that molt is a taxing process, if you are a bird, requiring a lot of energy. This means that for most birds, molt will not overlap with breeding or migration, both of which also require heaps of energy. Most of us know when a bird breeds and when it migrates, and if you learn when and how it replaces its feathers you suddenly have a much more complete picture of a bird’s life. Learning the differences of molt strategies between species and subspecies is yet more illuminating, as these often speak to differences in breeding and migration strategies, allowing one to consider how taxa evolve. The family accounts of this information-rich book are replete with examples of how and why molt strategies evolve, allowing for conclusions to be drawn about “big picture” concepts in bird evolution. Here I submit a dual entry as these two books cover a lot of the same ground, but I think it’s worth having both. Jobling’s title covers most of the scientific bird names for the whole world, while the Holloway title covers both English and Scientific names for the birds of the U.S. The Holloway title also has nice line illustrations by George Miksch Sutton. The two together provide good basic information about bird names, and answer a lot of questions that arise on long car rides that involve discussions about birds. This reference is a treasure trove of information on all the birds breeding in North America, including Hawaii. A tremendous reference that really flies below the radar of most North American birders, in part because it is meant more for ornithologists. This series is the primary source of information for North American bird species. Parts of the species accounts are easily digestible to the layperson, while others require a handle on some ornithological terminology. (Gill’s book below can help one suss out most unknown terms). So why would a field guide to the birds of Europe make it on this list? Well, many authorities agree that this is the greatest single regional field guide ever produced. That is reason enough to buy it, but there are others too. This book has sold around 1 million copies (combined sales of both editions (1st ed. 1999)). It covers over 700 species, yet is quite small and portable, and the front half of the book covers a great many species found in North America (waterfowl, loons, grebes, seabirds, herons, shorebirds, etc.). Also, a great many of the most regular vagrants to the ABA Area are treated. The artwork is superb, the text is concise and information-rich, and the layout and design are unsurpassed. Now in its 3rd edition, Gill’s classic textbook, provides the perfect foundation for students of birds to build upon their grasp of all things avian. 1. ABA Checklist: Birds of the Continental United States and Canada, 7th ed. If you are an ABA birder having one of these checklists on hand provides you a quick and easy summary of a bird’s status in the ABA Area. This list has lots of interesting and useful information on vagrants to North America. Peter Pyle’s Identification Guide to North American Birds has a lot of information that is not easily found elsewhere. Some readers complain that it is not user friendly, but if you are willing to put a little time in this book is a wealth of information. The Handbook of the Birds of the World series, edited by Josep del Hoyo and published by Lynx Edicions, is a phenomenal resource, richly illustrated, and provides endless hours of happy perusal. It’s only drawback is that it ain’t cheap and it takes up a lot of shelf space. If money were no object I’d have every volume (as opposed to merely three). The Singing Life of Birds by Donald Kroodsma, provides birders an excellent introduction and summary to the study of birdsong. The state breeding bird atlas projects that have cropped up around the country are great resources, where one can easily see the value of amateur ornithologists. Of course every birders should have an ABA Membership! Having Birding magazine, Winging It and North American Birds arrive on your doorstep is always a treat. They are jam-packed with information, and being an ABA member connects you to thousands of other birders all across North America. So what did I miss…? Thanks to Dan Lane and Al Jaramillo for chatting about bird books with me and for offering suggestions. Also thanks to Kenn Kaufman for granting permission to use the photo of him and “RTP”.